The N80 was born out of the demand for a boat that bridged the gap between the Nordhavn 76 and the Nordhavn 86. 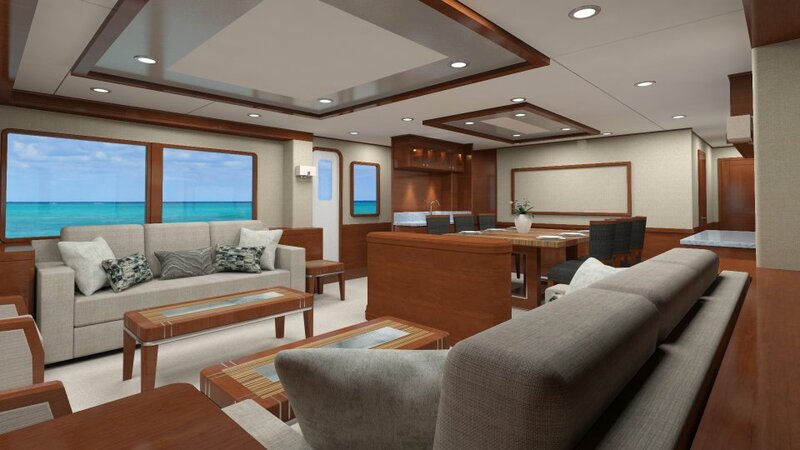 This new yacht will be powered by twin 375 hp John Deere engines, will have 4 staterooms and room for 2 crew. Optional layouts will include a captain’s cabin behind the bridge or an upper-level owner’s suite behind the bridge in lieu of the sky lounge. The boat will feature a beautiful, functional layout and modern styling. LOA: 78′ 8″ (23.98 m) Not including bow plank. 82′-3 3/8″ (25.1m) including bow plank. All exterior gel coat to be isothalic on superstructure, hull and non-skid . Structural Bulkheads: FRP foam cored in various thickness as called out on HCP. Interior cabin soles: FRP foam cored in various thickness as called out on HCP. Stern tubes: FRP 2.75″ DIA. 316L Stainless steel Y type struts with rubber cutlass bearing attached to hull and to SS shoe. Fuel Filters: One (1) Racor 900MAX duplex with 10 micron filter elements in addition to secondary engine mounted filters. One for each engine. All hose used to connect system to be Trident Red 202x 500F (260C) Silicon marine wet exhaust hose. 50 hp bow and 38 hp stern thrusters using 16″ (40.64 cm) and 14″ (30.48 cm) tunnels with proportional controls at five (5) stations. Hydraulically powered 180 gallons (681 Liters) per minute emergency bilge pump with manifold system and plumbing to four (4) bilge areas – Laz – crew quarters – ER – guest room area. TRAC #370 digital stabilizer system with 16 sq. ft. (3.6 sq. m.) fins and dual station control. Stainless steel kelp blocking plates forward of fins tied to bonding system. System is without winglet assembly. Fire/Smoke Dampers – Livostech Control Damper, 20″x20″ with Two Position Actuator. One (1) damper each installed on the engine room side of each blower for easy access. Each damper will be normally open and will close on SEAFIRE actuation. Struts: Custom #316L stainless steel strut arrangement per PAE design. Tanks to be fitted with a cross over pipe to allow equalizing tank level and filling from one fill pipe. Transfer manifold and 3.5 gallons (13.25 Liters) per minute fuel pump with timer switch and Racor 1000 fuel filter with 10 micron element which can transfer fuel from one tank to another and polish fuel while transferring. Transfer system can also polish fuel in day tank and return to day tank if needed. Fuel vent lines to be fuel certified, reinforced hose 1” (2.5 cm) I.D. Trident model #327 hose. Fuel fill lines to be fuel certified, reinforced hose 2” (5 cm) I.D. Trident model #327 hose. Electric: Four (4) Bosworth #GE-0400D-0-11-48-5252-GS One (1) in each water tight compartment – Laz – crew quarters – ER – guest room area. Wall Sconces at head of berth. Pilothouse console to be fitted with exhaust fans to evacuate heat build up. Walk in Shower with frameless clear galss shower door and stainless steel hardware. Interior of shower to be white molded FRP. Interior and exterior lights switches to be Vimar Idea. Interior switches to have black cover plates and gray switches. Exterior switches to have white covers and white switches, with weather-proof covers. Interior and exterior electrical outlets to be Vimar Idea. Interior outlets to have black cover plates and gray outlets. Exterior outlets to have white covers and white outlets, with weather-proof covers. All air con soffits to have LED strip lighting behind. Ten (10) 316 Stainless Steel Hawse Fittings: four (4) port and starboard 5″ x 10″ (12.7 cm x 25.4 cm) with cleats. Recessed into bulwarks where possible. two(2) on aft deck without cleats. Foredeck to have solid 316 stainless rail 1-1/2″ dia. (3.81 cm) with 1-1/4″ dia. (3.17 cm) stanchions. Bases to be round with fastening stud welded on bottom. 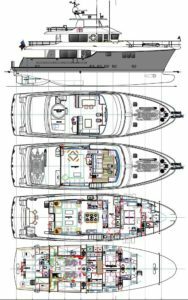 Deck Hatches: Per deck plan, two (2) Lewmar #60 “Ocean Series” on foredeck to include Oceanaire insect and privacy screens. One (1) Lewmar #60 “Ocean Series” over companionway to crew qrts. FRP Radar Mast with flag halyards port and starboard. Flybridge with FRP Hardtop, sink, U-Line #CO1224F drinks refrigerator with FRP door, and two (2) Stidd “Slimline” helm chair #500n-2×2 white vinyl and settees with Sunbrella covered cushions and tables with white Surrell tops, Sink to drain directly overboard. Stern Capstan Winches: Two (2) Maxwell VC 2500 24 volt port and starboard with Stainless steel bollards on raised FRP pads. Nordhavn (PAE) Name Plates x two (2) port and starboard side on fashion boards.